Directions - after entering your library card number on the page linked above, scroll down and click on Children's Resources and then click on BookFlix. That’s all there is to it! In our effort to build a community of avid readers, Upper Perkiomen Valley Library, as a branch of the Montgomery County-Norristown Library, subscribes to Scholastic BookFlix, an online literacy resource that pairs classic video storybooks from Weston Woods with related nonfiction eBooks from Scholastic to build a love of reading and learning. This engaging resource for grades PreK-3 will help early readers develop and practice essential reading skills and introduces students to a world of knowledge and exploration. BookFlix includes: >	110 fiction and nonfiction pairs, each featuring an animated fictional video storybook and an online nonfiction book >	Spanish language versions of 32 pairs >	Read-Along options for both fiction and nonfiction books >	Interactive educational games to assess vocabulary and reading comprehension >	Definitions and narrated text supports throughout the program >	Author biographies and selected interviews >	Safe, age-appropriate Web links so students can extend their learning on a topic >	and educator resources, including comprehensive lesson plans for each fiction-nonfiction pair. Children and teachers can access Scholastic BookFlix through our website anywhere there is an Internet connection – in the classroom, the computer lab, the library, even at home! 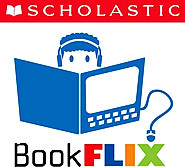 Scholastic BookFlix is specifically created to support non-, beginning and reluctant readers. It’s perfect for group reading activities, as well as independent reading practice at school and at home!